A paper presented at the « International Conference on Processing of Materials, Mineral and Energy », 29th and 30th july 2016, PACE Institute of Technology & Sciences, India. It had been published by Elsevier. This paper deals with the failure investigations of the first stage gas turbine blade of 30MW gas turbine. This blade is manufacture with of nickel based super alloy IN738. The main focus of the paper is to found the causes of failure of the blade. By the investigations, it is found that the blade failure takes place due to the combined effect of erosion, oxidation, overheating, and hot corrosion. A pubication in « Journal of Physics »: Conference Series, 2014. Wind turbine industry utilizes composite materials in turbine blade structural designs because of their high strength/stiffness to weight ratio. T-joint is one of the design configurations of composite wind turbine blades. T-joints are prone to delaminations between skin/stiffener plies and debonds between skin-stiffener-filler interfaces. In this study, delamination/debond behavior of a co-bonded composite T-joint is investigated under 0° pull load condition by 2D finite element method. The failure sequence consists of debonding of filler/stringer interface during one load drop followed by a second drop in which the 2nd filler/stringer debonds, filler/skin debonding and skin delamination leading to total loss of load carrying capacity. This type of failure initiation has been observed widely in the literature. Failure initiation and propagation behavior, initial and max failure loads and stress fields are affected by the property change. In all cases mixed-mode crack tip loading is observed in the failure initiation and propagation stages. In this paper, the detailed delamination/debonding history in T-joints is predicted with cohesive elements for the first time. The failure of the first stage blade in a steam turbine of 55 MW was investigated. The blade was made of 17-4 PH stainless steel and has been used for 12 years before failure. The current work aims to find out the main cause of the first stage blade failure. 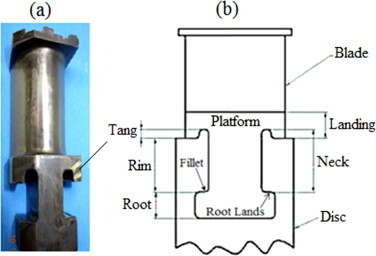 The result showed that the crack at the blade root tang was due to corrosion fatigue and the crack occurred at the blade root fillet owing to stress corrosion cracking.